DONEGAL heart attack patients will soon have access to state-of-the-art cardiac care at Altnagelvin Hospital in Derry. The unique cross-border collaboration follows the co-signing of a comprehensive agreement between the Western Trust in the North and the Saolta University Health Care Group in the Republic. The first-of-its-kind service will begin next month and will operate on a 24/7 round the clock basis. It is expected to treat up to 60 Donegal patients who suffer a heart attack each year. "Heart attack patients within 90 minutes road time, who previously would have been transported to University Hospital Galway by road or air, will now be transported the shorter distance to Altnagelvin Hospital for emergency treatment," said a spokesperson. The new health deal will also allow for greater co-operation on cardiac care generally between Letterkenny University Hospital and Altnagelvin Hospital. 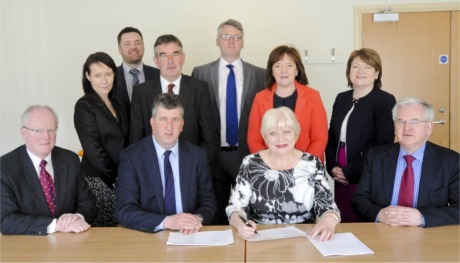 Western Trust chief executive, Elaine Way and Saolta University Health Care Group chief executive, Maurice Power, sign a new deal that will allow Donegal patients access to 24/7 primary coronary intervention at Altnagelvin Hospital in Derry. A consultant cardiologist employed by the Saolta Group has also been appointed to Letterkenny University Hospital and will contribute to the delivery of the new service from Altnagelvin by participating in an on-call rota. Western Trust chief executive, Elaine Way said: “The new service, which will be delivered by our exceptional cardiac intervention team, will provide real benefit to heart attack patients through rapid access to high quality, life-saving services."